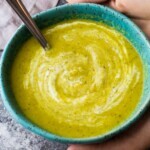 I’ve been going souper crazy with the soups lately! Well, it’s cold. I’m always cold! My favorite thing is to warm my cold hands up on Kai’s tummy. He thinks it’s hilarious, and his tummy is always pretty warm so it’s a win/win situation. Not only that but it’s cold and flu season, and I’m just hoping I don’t get sick this year. 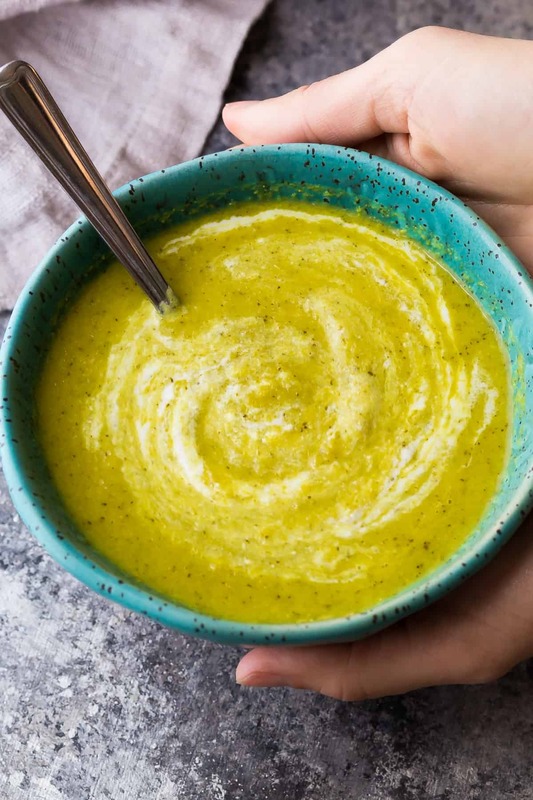 I thought it would be great to share a super healthy soup recipe that will fill us with nutrients to hopefully stave off any sickness. 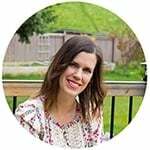 Today’s post is in partnership with Half Your Plate, whose mission is to help us to fill half our plates with fruit and veggies. It can be especially difficult at this time of year when the holiday cookies are a-plenty. Well, with this soup, you are filling more than half your plate (ahem…bowl) with veggies. 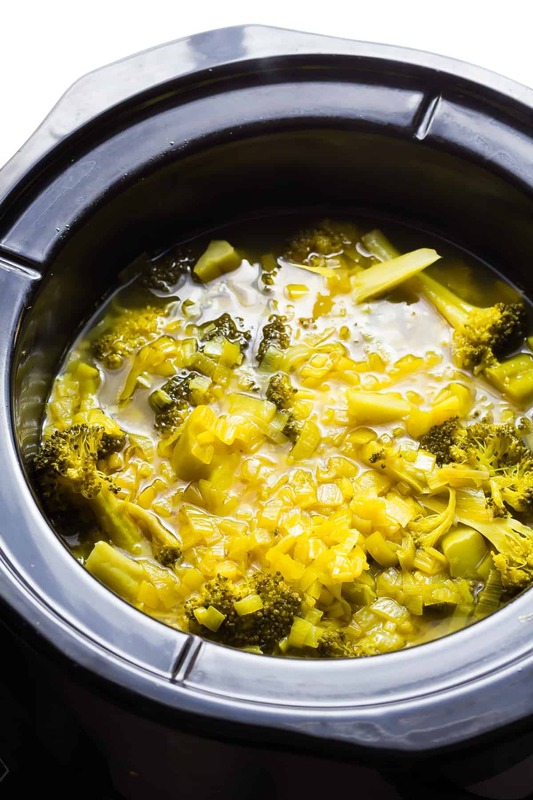 This broccoli, ginger and turmeric soup is seriously packed with healthy veggies. For more tips and tricks on filling half your plate with veggies, check out the Half Your Plate website! There’s a ton of great ideas and information. 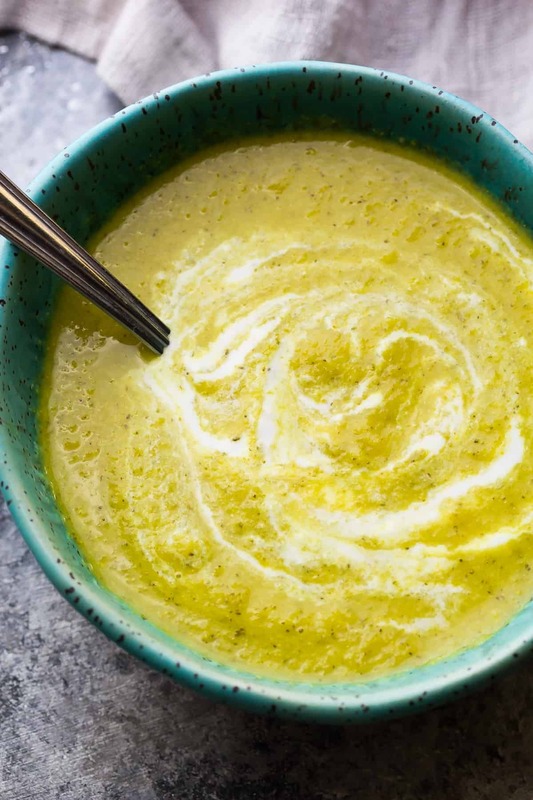 Today’s broccoli, ginger and turmeric soup is not only packed full of veggies, but also with anti-inflammatory ingredients: turmeric, broccoli, ginger and leeks. 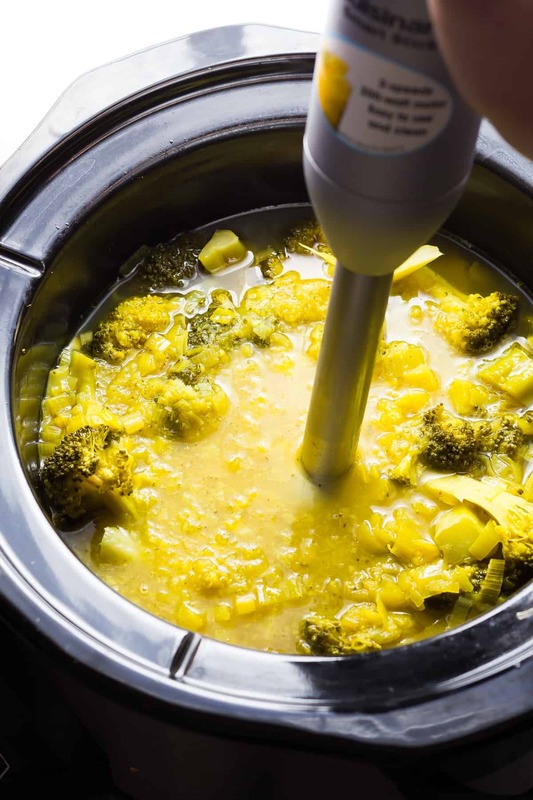 Did I forget to mention that this broccoli, ginger and turmeric soup is made in the slow cooker? Well it is, and it’s ridiculously easy to make, too. I couldn’t resist sautéing up the leeks in some butter first because in my opinion, there is no better smell in the world than butter + leeks. Then all you have to do is throw everything into the crock pot, hit start, and you are done for the next 3 hours. 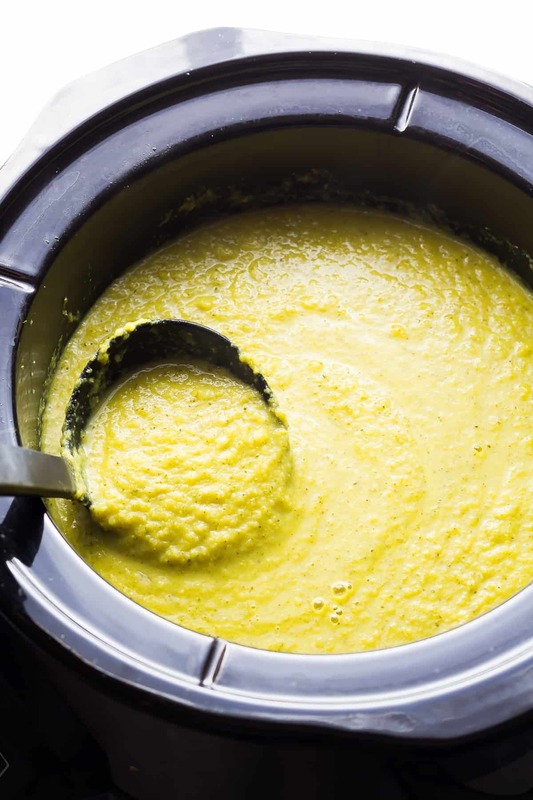 When the time is up, just puree your soup with a blender or immersion blender until smooth. This soup is great as is, or you can swirl some tangy yogurt in. So good! Disclaimer: this post was sponsored by Half Your Plate. As always, all opinions are my own. Heat a large pan over medium heat, and melt the butter. Add the leeks and cook, stirring occasionally, 8 or so minutes, until leeks are cooked through. 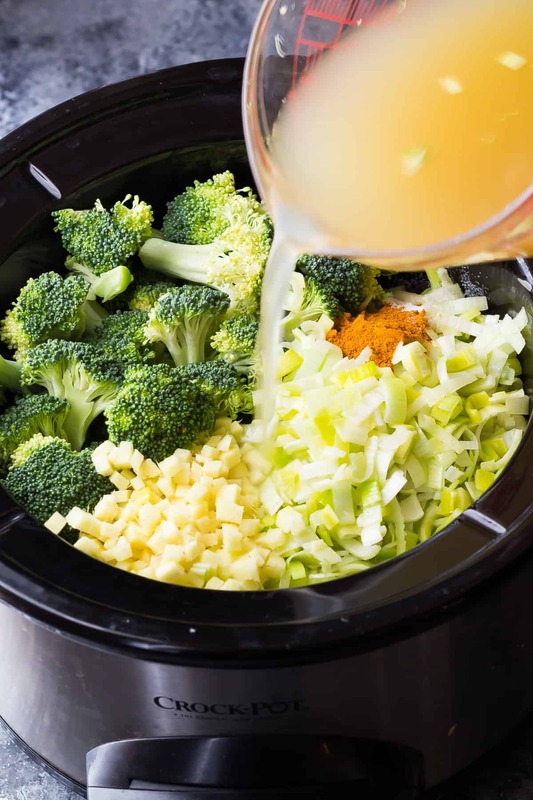 Transfer the leeks to a 5 quart slow cooker with the ginger, broccoli, turmeric, salt, sesame oil and stock. Cover and cook on low for 3-4 hours, until broccoli is tender. Using a blender or immersion blender, blend until creamy and smooth. Serve with yogurt (or coconut yogurt) and big chunks of bread. I made this stovetop with good results and flavour.. Added a sweet potato also.. First time cooking with leeks, I used the tops not Knowing they weren’t to be used but turned out fine. Glad to hear that, Lynn! Thank you so much for reporting back and for leaving a review! I made this on the stove, but added a LOT of baby bella mushrooms, Kale, and sliced water chestnuts. I cooked everything under a lidded pot, then removed the water chestnuts and mushrooms. Next, I used my immersion blender and pureed everything in the pot until smooth. Last, I added the mushrooms and water chestnuts back into the pot, and heated it through for @ 10 minutes. I’ve received so many compliments on this because of the texture and crunch! Thanks SO MUCH for posting this recipe. That sounds delicious! THanks for reporting back with your changes, Sandy! Loved that this recipe was so simple and delicious! Even though there aren’t a lot of ingredients, it was very tasty. Will double recipe next time. This will go down as one of my favorites! P.S. If made on the stovetop, how long will I cook it for? Will 30 minutes suffice? Hi Jan! I bet that would work, I would just simmer until everything is soft. Hope you enjoy! So happy you enjoyed, Ryan! Thanks so much for your review! I’m making for the second time as I write this. My son loves it! He told me that he felt really good after eating it. I’m on Keto and it fits into my way of eating as well. I added a little more butter when I sautéed the leeks. Hi Kristina! I’m so happy you’re enjoying the recipe! Thank you so much for taking the time to leave a review! I have made this twice and I love it!!! Besides the fact that it tasted AMAZING, my body had the most wonderful reaction. I have lots of health issues, one being severe bloat and inflammation and joint pain and I swear this helped with all of that. Oh I should add that it smelled so amazing that the second time I’m co-workers made me bring the entire batch in for them the next day and they all loved it too! This is definitely in my top 5 of favorite soups. I’m SO happy you enjoyed, Amanda! Thank you so much for taking the time out of your day to leave a review! I made this soup Sunday for a light supper and was disappointed in the final product. Very thin and watery compared to what the photos show. I ended up cooking up a few sweet potatoes and blending them into the soup to thicken it… that worked! But then I threw all caution to the wind and stirred in some grated cheddar … that was yummy and worked for us..
Hi Paulette! I’m sorry to hear that. If it’s watery and thin, it sounds like maybe some of the quantities were off? With 12 cups of veggies it should be quite thick. Thanks for your comment! I actually used 4 additional cups of fresh broccoli so I could use up the rest of what I had on hand. With the addition of the mashed sweet potatoes, it was perfect … and delicious. This was soooooo good! I made it in the IP. Sautéed the leeks in butter on the sauté function. Once soft I turned off the IP and added the ginger and seasonings and stirred it around. I then added the broth (chicken) and stirred it up then added the broccoli. Manual high pressure for 5 minutes and then a quick release. After it cooled a bit, I used the immersion blender and then added more pepper because I like pepper. It was soooooo good! Thank you for a delicious recipe! Im shocked at the depth of flavor with so few ingredients. I have a 6 quart. I should mention, since writing this review, my husband has already asked me to make it again- winning! Is there a substitute for sesame oil? My son is allergic to sesame. The soup looks amazing. If so, any reco’s for cooking time etc…? I follow your recipe very closely, however I make it w/ chicken bone broth, a little less salt , more black pepper and an extra half a TBSP of sesame oil. HEAVEN. Thank you! Woo hoo! So happy to hear that. Love hearing your modifications. Thanks, Lisa! Would I be able to freeze this if I was to make a double batch. Could I cook this recipe over the stove instead of the crock pot? Yes! Definitely! I’d just simmer it for 20-30 or until everything is soft enough to puree. Hope you enjoy it! I can’t eat leek as it upsets my stomach. I guess I could sub onion – would you suggest white/brown/red onion? And how many? Oops forgot the red immune soup is made with either reduced salt veg bouillon/ ham/ low fat streaky bacon cut into cubes used as stock. I also sometimes put butternut squash or sweet potato frozen cubes in it. Someone I gave the recipe to uses frozen chili puree in it. (Oh and I havfe been known to put peas in the green version they are great with broccoli. Also I keep meaning to try the broccoli with courgette.) Still its a great base and it is so cool to find someone else who came up with the same concept, I don’t know about you but I find the leek, onion, tumeric and herbs are great for keeping away colds and flu if eaten regularly during the season. Omg I just found your recipe and it is almost the same as mine, how cool is that. I didn’t put butter in though. I also put basil and oregano in( sometimes I put in thyme, or corriander. I make my stock from either tuna or swiss veg bouillon powder. or more often than not a small amount of the two. Sometimes I add frozen spinach cubes. Sometimes I add kale. Other times I add brussell sprouts or savoy cabbage or frozen chopped okra.. Basically I use this as my base and add different variances depending on what I have. I chop my ingredients very small and cook them in my rice cooker with some rice. I call it my green soup for immune boosting. I also use the leek,onion, turmeric, herb, black pepper, etc base with carrot and rice and red lentils again cooked in a rice cooker. To the person above don’t use ginger powder it is so not the same in soup (ginger powder is best for cookies) use frozen ginger puree cubes. We can buy them in the supermarket in the uk but if you cant get them locally you can make your own. Garlic puree can also be frozen in cubes. Basically I took an old Scottish recipe for tattie soup and adapted it to my rice cooker and added tumeric and ginger and herbs etc. This is my Red immune soup. I don’t have a slow cooker. If cooking on a regular pot, how long do you think it’ll take? Hi Marluce! I’d just cook until the broccoli is soft enough to puree. Should be 20 minutes or so simmering? Hello, is there any substitute for sesame oil? My daughter is allergic. Hi Jennifer, you could just leave it out, but the soup might lack some dimension. Is there a substitute for the butter? I’m looking for dairy free, but this recipe sounds great and I really want to try it. Can I use a rock Pot? This might be an awful question but… can I use died ginger from a bottle. If so, how much? ? Hi Annie! I’m sure you could do it that way, but I’m not sure on how much powdered ginger you’d need. Let me know if you end up trying it! …… However adding just a pinch of black pepper increases the Turmerics bio-availability a hundred fold. Is the nutrition info for 6 or 8 servings? for the rookies out here, what the hell is stock . . . Is it the same as “broth”? . . . How do I make it? Is there a “veggie stock”? (I don’t eat much meat )Can I keep it around for a while in fridge? You guessed it, just me and a fat cat, so I pretty much like to use up supplies before they go off, bad:: kinda like glue, or stain ;o . . . OK, thanks for comments. Hi Denise! This sounds so good. Do you happen to know if you can freeze it? Hi Pat, I haven’t tried but most soups freeze really well. What kind of stock do you use? I have one vegetarian family member and was wondering if a vegetable stock will be suitable. Even though it’s hot and humid in Chicago, I had to try this. It’s fragrance is filling up the house and I can’t wait for dinner! Even though its hot and humid in Chicago right now, I had to try this! Do you think olive or coconut oil would work? I don’t have sesame. Hi Kerry! The sesame oil really brings some dimension to the soup…I’m afraid it won’t be the same without it. Toasted sesame oil or regular? So this may be a silly question but what part of the leek are we using? I look forward to making this soup as it looks delicious. Hi Katrina! Not silly at all. You use just the white and light green parts of the leek (not the leaves). This video shows the part you want to use for this soup: https://www.youtube.com/watch?v=njMtD7Hnlb8 I hope you enjoy it! This looks delicious. I can’t wait to try it. Do you think it will get bitter if it cooks on low longer than 3 hrs? I would like to make it on a work day or should I make on a weekend and heat up during the week? I made this yesterday and it got raves reviews from all! Thanks for the great winter warmer! I have made this soup twice in the last two weeks! Love it…I’m actually making a pot as we speak. I haven’t used the slow cooker for this yet, but it works beautifully in the stove. Can you tell me how long it will store in the fridge? Hi Suzanne! I’m so glad you like the soup 🙂 It should keep for 4 days in the fridge and also should freeze well. Hey, I’m about to make this soup on the stovetop. How long do I cook it for if I’m just cooking it in the pot ? I have a bottle of turmeric on my pantry shelf and haven’t opened it yet. I bought it because I know it’s supposed to be good for us, but I’ve been putting off trying it. Your recipe has inspired me to give it a go! You mention that cooking on high may cause bitterness. Would the same be true for cooking under pressure in an electric pressure cooker like an Instant Pot?